Well, in addition to a couple of other tweets that suggested perhaps just a hint of hostility towards Islam and its adherents (“Who the hell do these Muslims think they are?”, Dawkins demanded, followed by “How has UCL come to this: cowardly capitulation to Muslims? 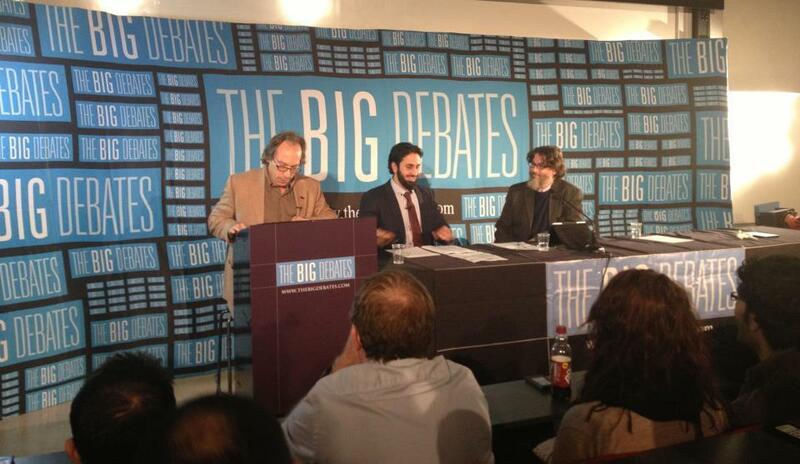 Tried to segregate sexes in debate between @LKrauss1 and some Muslim or other”) what is Islamophobic – and, yes, not a little racist – about Dawkins’ response is that he should publish damaging accusations against a Muslim organisation without bothering to establish the facts of the case. He wasn’t the only one. On Monday UCL issued a statement declaring that, although they were “still investigating what actually happened at the meeting”, they nevertheless accepted the charge that “despite our clear instructions, attempts were made to enforce segregation at the meeting”, and on that basis they announced that iERA was banned from holding any further meetings at UCL. 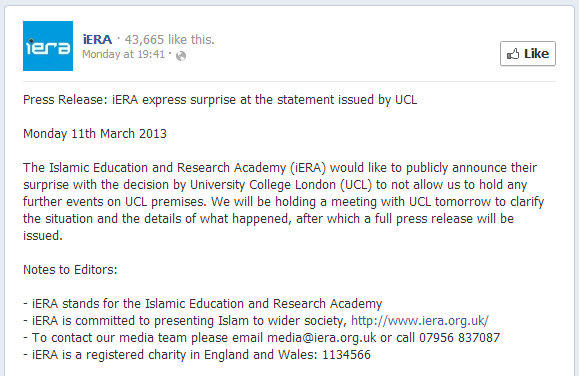 For their part, iERA responded with a press release expressing their “surprise with the decision by University College London to not allow us to hold any further events on UCL premises” and stating that they would be meeting with UCL to clarify the situation. In further tweets Krauss reported that he had held a subsequent meeting with iERA, as a result of which he appears to have accepted their assurance that they had no intention of forcing men and women to sit separately at the debate. But that still wasn’t good enough for Krauss. 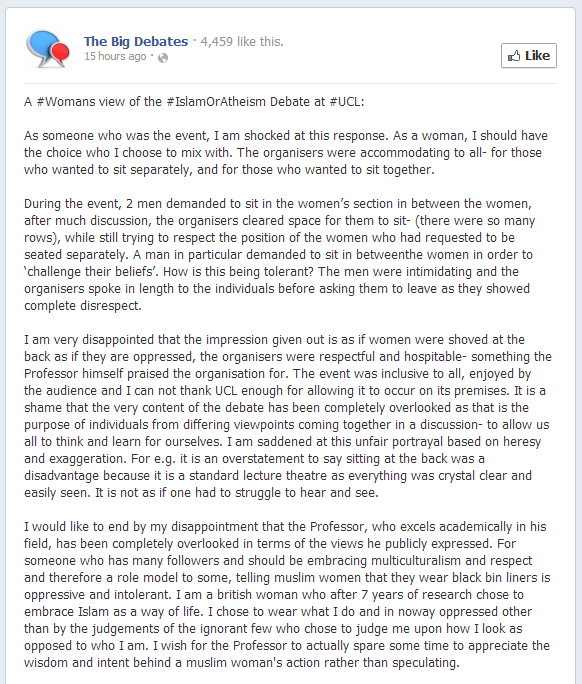 “I was told there would be no gender segregation,” he complained, “whereas their intent was voluntary gender segregation.” In other words, what he is objecting to now is not that gender separation was imposed on those attending the debate; rather, his argument is that Muslim women who wanted to sit in their own section apart from male members of the audience should have been prevented from doing so. Atheists like Krauss and Dawkins like to portray themselves as promoters of Enlightenment values and women’s rights. But when it comes to Islam, they ignore empirical evidence and abandon rational thought in favour of blind adherence to dogmatic anti-Muslim prejudice. As for supporting feminist principles, this evidently doesn’t extend to respecting the right of Muslim women to follow their faith – or indeed to defending them against harassment by fellow male atheists. This entry was posted in Analysis & comment, Featured archives, Secular, UK by Bob Pitt. Bookmark the permalink.